“The Teaching Coats Project” is a hands-on professional development experience for educators. 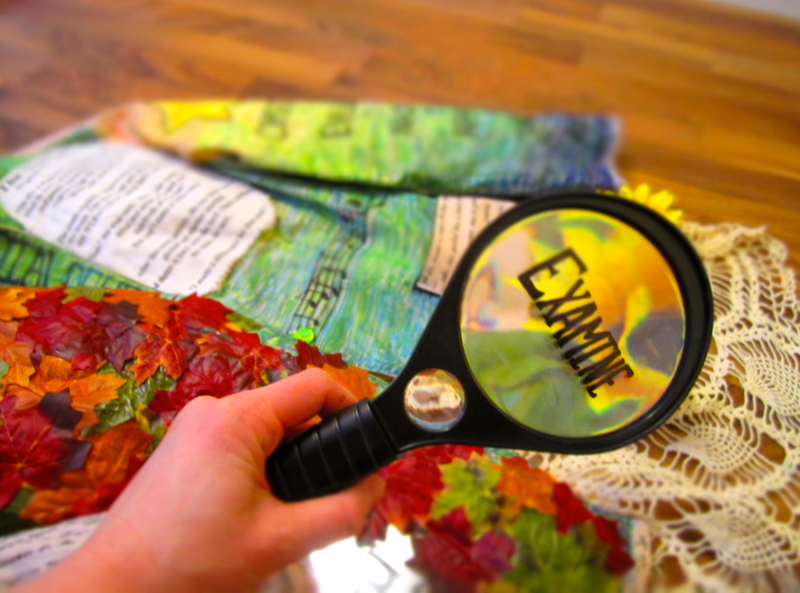 Participants reflect on their practice using mixed media collage to create a symbolic, wearable “Teaching Coat”. The process of making a “Teaching Coat” involves interacting with a personal selection of writings, illustrations, found objects, fabrics and colours in a creative, meaningful fashion. The goal is to discover, represent, celebrate and share facets of one’s professional practice and “teacher within”. 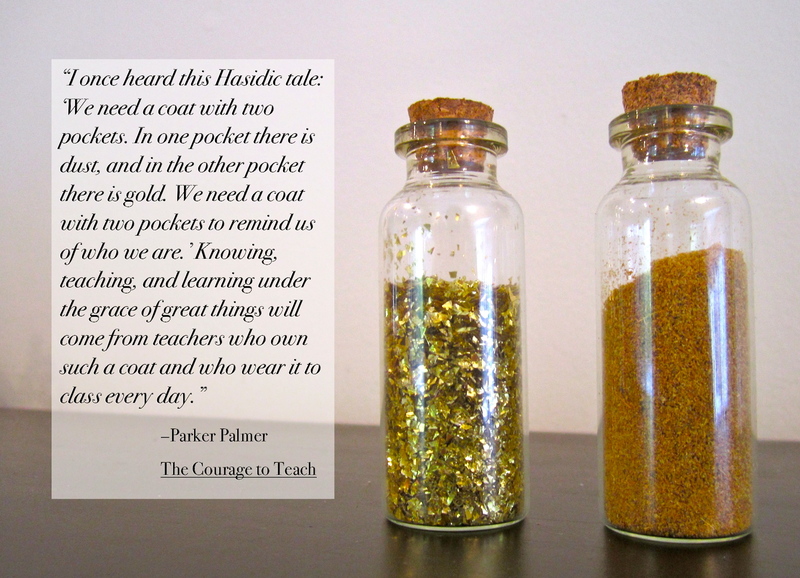 Inspired by Parker Palmer’s writings in The Courage to Teach, a central theme of “The Teaching Coats Project” is “teacher authenticity”. 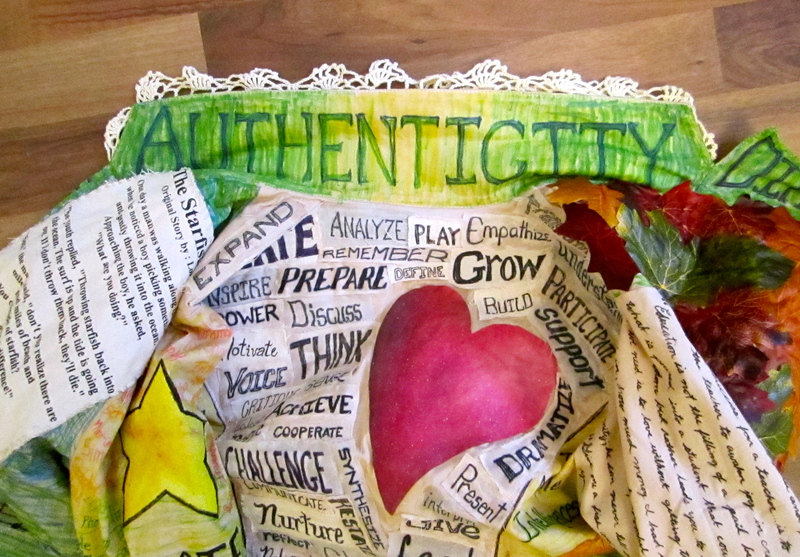 Through this project, teachers may discover a personal definition of authenticity as they encounter and respond in the creative and philosophical dimensions of the creating a “Teaching Coat”. Creating a “Teaching Coat” can be a way for teachers to discover, record, and symbolize aspects of their professional identity and purpose in a tangible way. 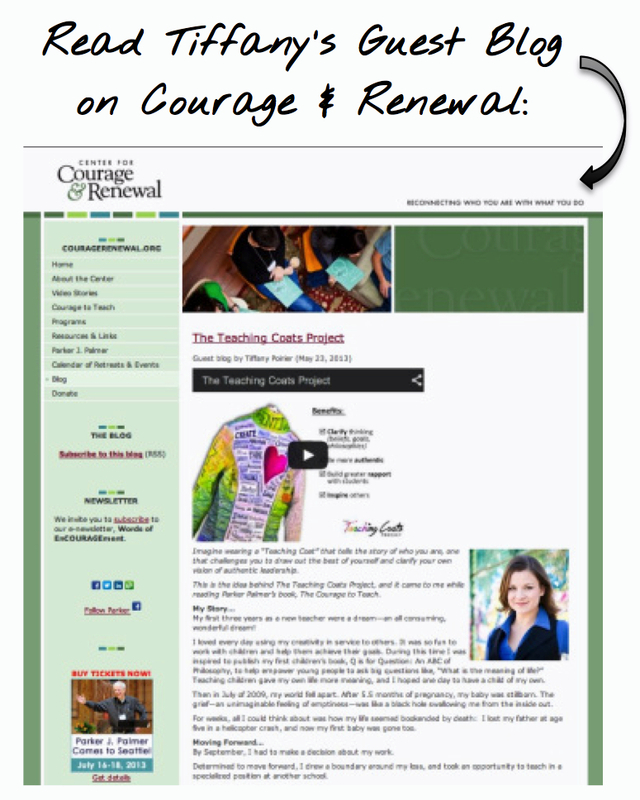 Wearing one’s “Teaching Coat” may be a special reminder and mediation for those times when, as Palmer discusses, we find ourselves in need of courage and renewal. As a part of reflective practice, teachers may choose to add to their “Teaching Coats” over their course of their careers, with the cloth serving to mirror back and archive their journeys. Wearing one’s “Teaching Coat” may inspire dialogue with colleagues and students. It can be used as an “ice-breaker” or lesson aid–or as the catalyst for a “Learning Coats Project”. Those who have explored this process are invited to share their experiences or images of their “Teaching Coats” in the galleries on this website as a way to promote dialogue and inspire others. Please click “Get Involved” for more information. I was deeply moved and driven to further explore this powerful coat metaphor. WHAT WOULD MY TEACHING COAT LOOK LIKE? Reaching for a pencil and paper, I began to sketch ideas for what I would call my Teaching Coat. I could start with a blank white lab coat—my tabula rasa. 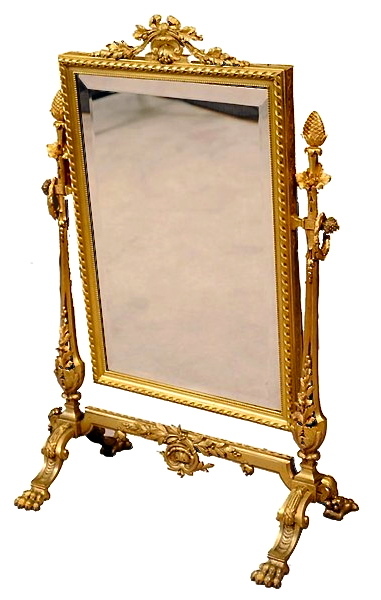 I would put gold in a little glass bottle in one pocket and dust in another bottle in the other pocket, and then go on to adorn the coat with other such symbols to help remind me of who I am. Wearing the coat might help me to feel grounded, connected and centred amidst the day-to-day flurry of my elementary school teaching practice. This could be my unique way of recalling and wearing the Courage to Teach as I do my heart: on my sleeve. Although not yet fully formed in my mind, I was in love with the project. To grow the Teaching Coat, I could write on it my reflections or quotes that had inspired me, or attach teaching memorabilia and sparkling odds and ends that would be totally unique and personal. I felt transported and purposeful when envisioning my Teaching Coat and thinking about what stories it would tell and how it would tell them. As an exercise, it a powerful and validating creative experience to toss ideas around, talking aloud of my plans for how I would represent the different facets of my experiences, philosophies, inspirations, goals and visions as a professional on the Teaching Coat. And even before I could describe it in words or knew what it would finally look, I saw its luminescent shape with my mind’s eye. Like a beacon drawing me onward. The symbol seemed to promise something so important: a glimpse at my own truth. In time I saw how my Teaching Coat was not such a tabula rasa as I had first thought. My “teacher within” seemed to emerge itself in details through the skin of the cloth–as if the shape of it had been there all along. Like Michelangelo said of his task in carving the sculpture David, my job in creating my Teaching Coat was to simply clear away the excess/debris/untruths to reveal that which was essential/artwork/truth that already lay within. In time I saw how my “teacher within” emerging through the skin of the Teaching Coat as if the details had been there all along. It was not such a tabula rasa as I first thought. Like Michelangelo said of his task in carving the sculpture David, my job in creating my Teaching Coat was to simply clear away the excess/the debris/untruths to reveal the essential/the artwork/the truth that already lay within. As I worked on the project, I discovered how the very process by which I was creating my Teaching Coat was a mirror for my journey in creating myself as a teacher. Sometimes I felt intimidated to work on a certain aspect, afraid to “mess up”. Other times I would have brilliant idea in theory that didn’t work out in practice. Occasionally I would feel I wasn’t getting results and want to quit, but then come back the next day determined to try again. But most of the times, I would marvel at how right things can feel when I would get into the “flow” of what I was doing. It’s been said that “how we do anything is how we do everything”–I certainly saw this in the way the story of making my Teaching Coat is also how I make my life as a teacher. 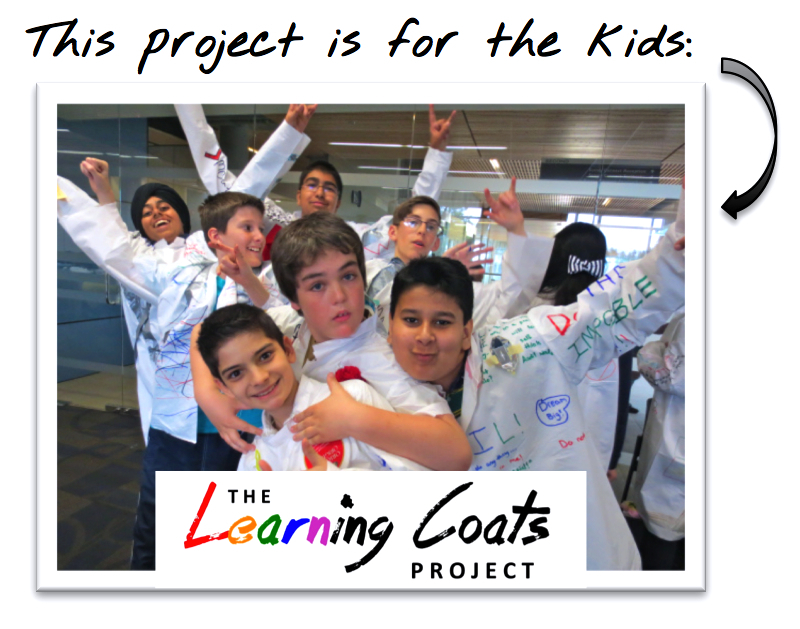 When I first started sharing the idea for the Teaching Coats Project with others, it sparked rich conversation. I would ask teachers, if you had a Teaching Coat, what would it look like? The responses were so varied and inspiring that they often sent me back to work on my own Teaching Coat with even greater enthusiasm. As more teachers got word of the project, many became intrigued and asked how to get involved. Desiring to explore and facilitate this process for others on a larger scale, I began to create a professional development program around the Teaching Coats concept. I wanted to present the Teaching Coats concept in a workshop setting as a unique opportunity for teacher growth. My hope with the Teaching Coats Project was that through it more of us could learn about who we are while recording our meanings in the cloth of Teaching Coats we could both analyze and wear. Over time I saw how the Teaching Coat process contributed to increasing my own transparency and reflexivity as a professional. It was like tattooing the soul of the “teacher within” in a place where myself and others could see it. Occasionally I thought wearing my Teaching Coat might make me feel silly or too vulnerable, and I knew the roots of these fears needed to be understood. Because students only feel safe when we are real with them, Teaching Coat or not, to be a great teacher I would have to “wear my heart on my sleeve”. At least with a Teaching Coat, I would have taken time in advance to know my own heart. I would make sure that my Teaching Coat was a thoughtful, authentic symbol of my professional identity, revealing only those personal topics I felt comfortable sharing and which would add value to students’ learning. Going deeper into the project, I faced this question: What is too personal or sacred to share in a public way at work? I also wondered: Which facets of my personal identity would I want to share in some professional contexts, but not in others? Through reflection, I found that my Teaching Coat, in how it was becoming like my “professional uniform”, was the perfect symbol to express the movable boundary between my personal and professional identity. After all, a Teaching Coat, like any coat, can be put on to go to work, but taken off when arriving home. And as teachers living in both private and professional worlds, we daily negotiate between the two and our Teaching Coats “track in the mud” from both places. I found it fascinating to examine how the ways our Teaching Coats are both made and lived in provides valuable critique of our teacher identities. But could I not also explore and share my teacher identity by making a blog or website? And why in this digital age should my Teaching Coat—with roots in homespun textile traditions—be of any interest or consequence to students who live amidst a flurry of gadgets and technologies bombarding their attentions? The answer for me came from a realization that to be a student is to be an embodied human—not a mere brain in vat plugged into a “Matrix” of sorts. Students will always be drawn in and want to learn from real leaders who exhibit courage, playfulness, and open-heartedness. Students will always crave multi-sensory learning experiences they can see, hear, smell, taste and touch. And when I finally came to truly understand the value of my Teaching Coat for myself and my students, the knowledge presented itself on a visceral level. It came to me while dyeing, ironing, sewing, and writing reflections on fabric. It came to me while flipping through old photo albums and unpacking dusty boxes of teaching memories. It came to me with force the first morning before my students arrived, while gliding about the classroom feeling the energy of my Teaching Coat around my shoulders. But the most poignant moment affirming of the value of my Teaching Coat comes to me when I open the classroom door, the students walk in and see it for the first time. It comes to me in the moment I see in their faces a particular expression I live for as a teacher: that curious tilt of the head, a widening of the eyes, and a slight drop of the jaw that together suddenly signify inspiration! As well, there was something exhilarating about the prospect of sharing my Teaching Coat with others! I imagined how fun and dramatic it would to be to sweep through the classroom door like a wizard in my magical, self-tailored Teaching Coat. Beholding the blaze of colours and multiple dimensions of the storied cloth, the students would wonder, “Who is this person?” And like a matador holding an irresistible a cape, I would find students drawn in with questions about the origins of this unusual fabric art piece. Perhaps the children would gather in a hushed circle to pass around the artifact, exploring it hands-on, while I told of the secret meanings and stories behind each feature and attached treasure. This is how the Teaching Coat would help present who I am as a teacher and begin to establish an atmosphere of self-discovery in our class. The Teaching Coat would be a catalyst for a rich discussion of identity and a segue into the first project of the year: students making their own Learning Coats. A natural match to my Teaching Coat, the Learning Coats project would be about students discovering and expressing who they are as learners. Throughout the school year, we would add to our respective coats, discussing and reflecting on the meanings made in process. These coats would be our personal totems and engaging with them would build community. Students would began to see one another’s lives as unfolding like these works of art. 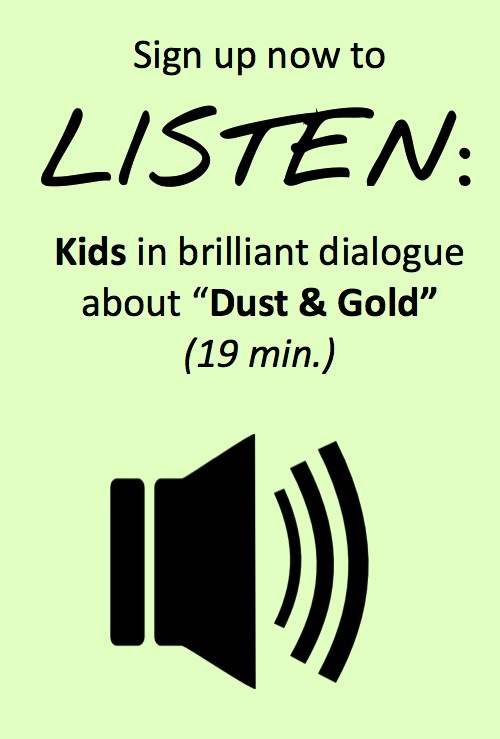 And when carefully briefed and invited to try on one another’s coats in circle time, students might feel like they are glimpsing into one another’s worlds— this could be a part of learning perspective-taking and a doorway to empathy.